This entry was posted on April 10, 2015 by Posturite. Traditional face-to-face induction training can be time-consuming, costly and inconsistent. Which is why more and more companies are now choosing to deliver their induction training via e-learning. We have created bespoke online induction courses for a number of clients who recognise them as a much more convenient, consistent, cost-effective and speedier way of getting new staff on-board. Users no longer need to travel or take time away from their desks to receive their training. They can choose when and where to complete the online course. The specially-written programs also deliver 100% consistency of message – something rarely achieved when face-to-face training is carried out by different people. Companies that have replaced face-to-face induction training with our bespoke e-courses have been able to show significant savings in time, manpower and cost. Others have opted to combine the old and the new, using e-learning for more standard parts of the induction process and face-to-face training where role or location-specific information is required. By linking the bespoke induction course to our new intuitive ‘training matrix’, it is also possible to determine which courses from our fast-growing e-learning library would be most relevant to the person’s role within the organisation. These can then be bundled together into flexible packages that offer a far more cost-effective compliancy solution than having to buy a number of individual licences. Because every organisation’s needs are different, all of our induction courses are unique. We take a detailed brief, write the course, produce the graphics and put it together into an interesting, stimulating and easily digestible package. As with all our other e-learning courses, the induction course is supported by our unique online management system which captures essential information, creates reports, and provides a fully-auditable trail of actions required or taken. 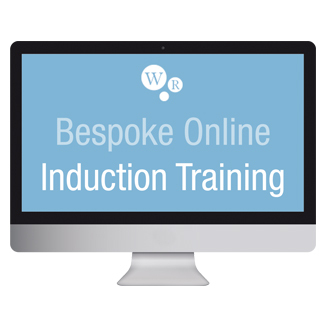 Induction training is just one example of the bespoke programs that we can create to augment our ever-expanding library of standard e-learning courses. Almost any subject can be catered for. All our bespoke courses are developed to the very highest standards using best practice learning methodology drawn from our years of experience in both classroom and computer-based training environments. Numerous interactive and media aspects can be incorporated to enhance the learning experience. We will guide you through the entire design process to make sure that your unique product achieves your desired learning outcome in the most time and cost-efficient way.